This engineering analysis was written by Harry Lundberg, an experienced golf industry consulting engineer who has worked with many top golf industry engineers and holds numerous golf patents. In addition, he has worked with many top PGA, LPGA and Senior PGA professionals. The technical analysis starts off in easily understandable language describing his experience teaching Simple Swing to all types of students from beginners to pros. About 3/4 of the way in it does get into analyzing the actual physics of the advantages of Simple Swing. This engineering analysis compares the traditional golf swing to Simple Swing which is a next generation golf swing. - A significant increase in distance. Tests using players of all levels including pro’s showed gains of 10 to 25 yards, with the greatest gain going to the higher handicappers. - An enormous increase in accuracy. Above all, golf is a target game. Improved accuracy is vital to better scoring. - A repeatable swing that can be learned in days and taken to the course almost immediately. - A swing that can be modified readily with little adjustments to suit different anatomies. - A swing that is still with the player after a long layoff. To see how Simple Swing solves the problems in the golf swing we must simultaneously explore the difficulties commonly experienced and why they occur. 1. Poor grip, hands in the wrong position – excessively weak or strong. No clear idea of what would work for him. A poor grip often leads to flipping the hands to square the club at impact, which actually decelerates the club, releases the stored energy in the shaft prematurely, and often puts the club face off line at collision with the ball. Too upright or too squat. Knees bent excessively or hardly at all. It is difficult to make a consistent backswing and reach a strong top from which a powerful stroke can be made. Stance too narrow or too wide – off balance swings. The bending of the upper body is at the waist and not at the hip sockets, creating a poor spine angle. Poor posture with the back badly curved and the head hanging down over the ball. From any of these, the takeaway is erratic and leverage is lost while making the swing. Arms in too close or too far from the body. Ball position too far forward, or too far back, in the stance, ultimately yielding topped or fat shots. Simple Swing solves all of the above with very definite, special, power thumb grip; front arm position; and a unique wide stance that takes all of the guess work out of the set up. It can be learned in 10 to 30 minutes. A slide or sway off the ball and onto the back leg. From here the player finds it difficult to get back to the front side during the downswing. He may end up lunging back to the ball and dragging the whole body and the club with him. The result is often an open face hit and a corresponding slice. Or a topped shot. Or he may be unable to freely move back to the ball and end up hanging back on the right leg (or left leg if he is lefthanded) while he makes the stroke. This position produces weak shots, slices and topping the ball. The body, arms, hands and the club are not drawn back in unison but the several parts are moving independent of one another. This creates a less than desireable position at the top, from which it becomes difficult to synchronize all of the parts in the downswing. It becomes very hard to move the club in a single plane stroke. If the club changes plane during the swing, the player must add additional force (Newton’s first law) to the thrust or the club will decelerate. In many cases the player is already swinging at his limit and cannot create the extra force needed. Out of synch swings also greatly reduce the chance of a square, on center, contact with the ball. The effective mass of the collision is reduced and the ball goes off line as a weak shot. Frequently the player initiates the takeaway with his hands. One result is that he wraps the club around the backside and overturns, making it vitually impossible to get back to his front side and to the ball, similar to the sway move described above. The front arm moves ahead of the torso and virtually flattens onto the chest. This makes a synchronized downswing, with the club head catching up to the hands for a square hit next to impossible. Net result – a block or a slice. Another common fault is that the player takes the club back with his hands outside the target line. He becomes trapped on his back leg. On the downstroke he initially casts the club backwards in an effort to free himself. He ends up falling back, away from the target, with a weak, slice swing. Bobbing the front shoulder and head up and down in the takeaway, leading to an erratic swing and miss hits. Any of these common faults, or combination, prevents a powerful on plane hit and reduces energy transfer to the ball. Accuracy is greatly reduced. With the proper set up and grip, Simple Swing allows the player to arrive at the top of the backswing in a tight, compact position. All he needs to do is rotate the shoulders and top of the spine to initiate the takeaway. He will make a one piece backswing into a defined “slot” at the top. Swaying, elevation changes, casting – all of the above difficulties – are eliminated. 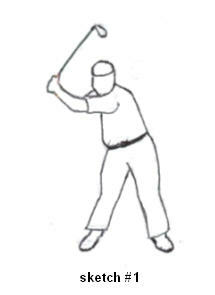 Sketch #1 shows the player finishing his backswing using a five iron, employing the Simple Swing setup and takeaway. He is in a very compact position with what looks like a short backswing. However he has a full shoulder turn and all of the big muscles of the body are stretched for a powerful, on plane hit. His position is very solid and stable from which it is easy to release the big muscles efficiently. The right biceps is coiled, stretching the right triceps, which enables the right side to be fired with power. The center of gravity of the body has not swayed which ensures that the club head will arrive at the ball in the same position it was in at address. The club face may look out of position but in fact it is oriented in the exact same position as at address. The unique grip and left arm setup keeps the club face square to the target through the entire backswing and downswing, promoting extreme accuracy. A large backswing with the hands well above the shoulders is not needed for power since the big muscles are fully actuated and will dominate the downswing. The head and left shoulder have remained at the same elevation off the ground as in his setup, which allows him to return the clubhead squarely to ball. The lower part of the body has barely turned. This allows the upper body to generate a great deal of torque – power- in a fashion that is commonly called the X factor.